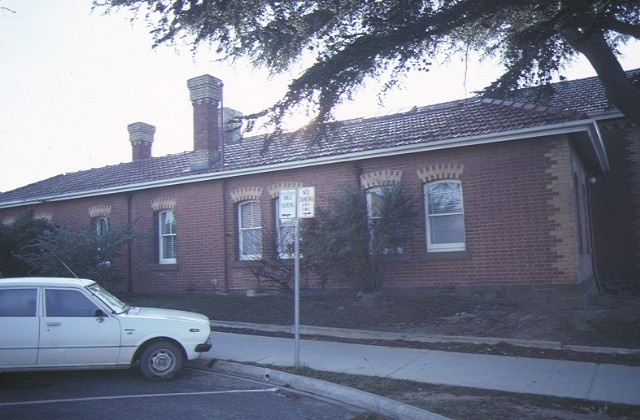 Completed in 1866-67, Ararat Court House is a small, symmetrical brick building designed by Public Works Department architect Gustav Joachimi in the Victorian Free Classical style with a recessed entry and gabled roof. As with other examples of this style, the vestibule to the court house features a semi-circular brick partition wall with double-entry into the court room. The front exterior, characterised by two Romanesque arches below a circular vent in the gable pediment, also featuresdichromatic brick patterning, bracketted eaves, and brick machicolations to the gable. Internally, the court house has a simple cruciform plan with a central court room flanked by offices at the sides and rear. The original ground plan shows the building dominated by the courtroom with a large office at rear for the judge, and similarly sized offices adjoining this space on both sides. In 1873 a jury room was added to the rear of the western office wing and a new jury box was built in the court room by contractor T. Walker. Major alterations and additions were undertaken by Thomas Corley in 1879-80, when the court room was extended into the space formerly used as a judge's room. A new judge's room was built at the rear, and a sheriff's office was added as an extension to the eastern office wing. During these alterations a first floor gallery was also added to the building and a lantern was installed on the roof of the court room. In 1908-09 Robert Ludbrook built an office for the Department of Crown Lands and Survey by extending the western office wing almost to the line of the facade. During the 1950s the building was re-roofed with terra cotta tiles, and around 1960 the original prisoner's cell was converted to two toilets and a cleaner's room. The building, still serving its original purpose as a court,retains early fittings and the front facade is notable for its high degree of intactness. Ararat Court House is of historical and architectural significance to the State of Victoria. Ararat Court House is historically significant as a record of the progress of the once major goldfield town of Ararat in central Victoria. A Court of Mines, established at Ararat in 1857, operated from a temporary wooden building until 1859, when Ararat was declared a General Sessions District and a basalt court house was erected in Vincent Street. This court house was succeeded by the present building which reflects Ararat?s status as a site for Supreme Court sittings after 1860 (until 1909). The building is historically important for its internal plan which incorporated an assessor?s room, a hallmark of the Court of Mines era. It is also historically important as a fine, relatively intact example of the work of Public Works Architect Gustav Joachimi who designed three other court houses in the 1860s, powder magazines at Bendigo (1863) and Smythesdale (1866), the gold office at Avoca (1860), the warden?s office at Wood?s Point (1864), and who also worked extensively on Victorian prison buildings, notably at Pentridge (1858) and Beechworth (1858-64). The building is architecturally important as a distinctive example of a Victorian Free Classical court house. 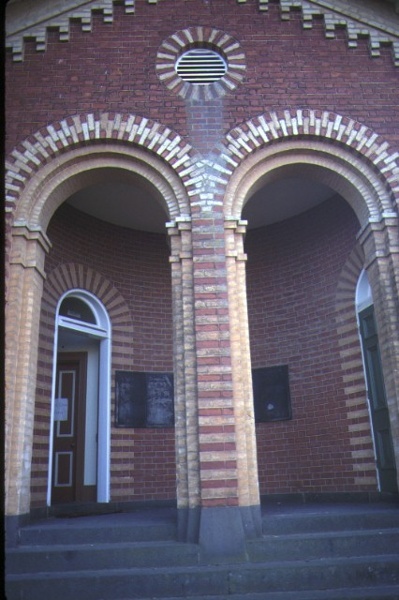 The building, with its semi-circular recessed entrance vestibule and double-arched entry to the court room, is architecturally similar to other examples at Maldon (1860), Beaufort (1864), St Arnaud (1866), and Penshurst (1877), but Ararat is unusual for the striking dichromatic brickwork on its facade and the machicolation motifs to its gable. 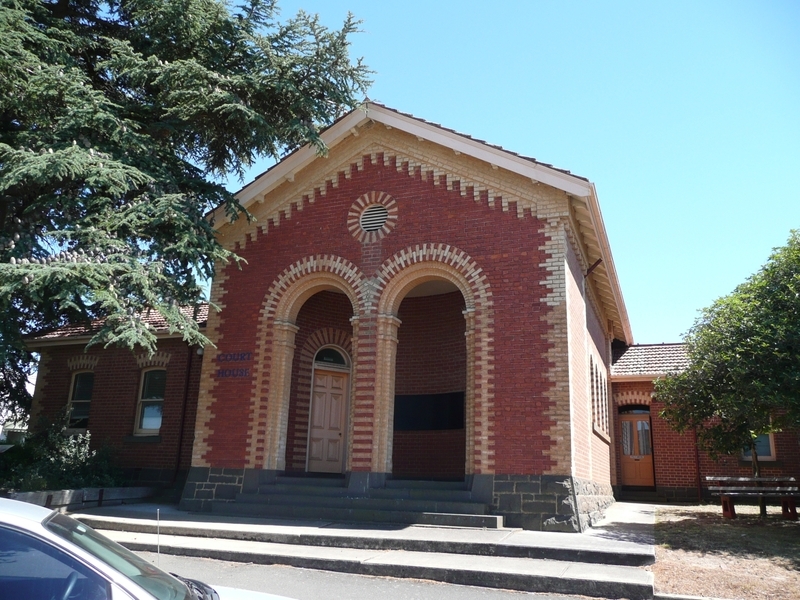 Within the group of Victorian Free Classical court houses with recessed entry and gabled roof, Ararat Court House is architecturally significant as one of the more successful and aesthetically pleasing buildings in terms of its proportions, decoration, detailing, and effective use of a prominent corner site. The building's tapered basalt plinth suggests solidity and solemnity in striking contrast with the almost gaudy brickwork above, yet the overall impact is essentially clear and simple. In particular, the proportional relationship of arcade height to gable height and circular vent size is well-balanced and resolved, and although later alterations have significantly enlarged the building and used a different brick, this work has repeated the original fenestration and has successfully maintained the original design intent. Ararat, Ararat Rural City Council. 1. 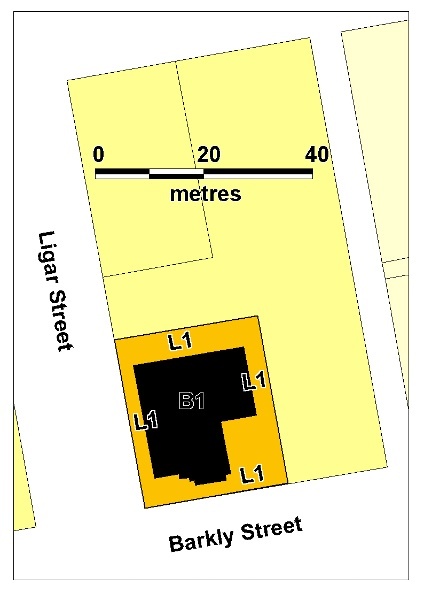 All of the building known as Ararat Court House marked B1 on Diagram 1657 held by the Executive Director. 2. All the land marked L1 on Diagram 1657 held by the Executive Director being part of the land described in Police Reserve C82491. * All repair and maintenance works specifically recommended in the Schedule of Works, pages 35-36 of the Conservation Management Plan (Robert Sands, 1996), provided that major works are carried out under the direction of an appropriately experienced conservation practitioner. * Installation of a Duress alarm system provided that existing wiring conduits, where possible, will be utilised and that installation will be carried out in places with the minimal visual impact and will avoid any decorative elements. * Installation of single cylinder deadlocks to the exit door from the court room to the magistrate's chambers and to all doors opening to the magistrate's chambers providing that no original door hardware is removed. * Painting of previously painted walls and ceiling of the court room in colour schemes consistent with the original scheme provided that preparation or painting does not remove evidence of the original paint or other decorative schemes. * Removal of paint from originally unpainted or oiled joinery, doors, architraves, and skirtings. * All interior alterations are permit exempt, excluding structural alterations, provided that such work has no effect on the exterior of the building. 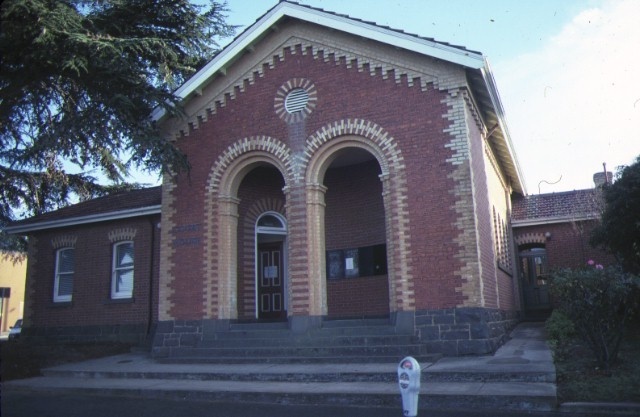 The Ararat Court House has significance for the striking brickwork on its facade and for its proportions, detailing and decoration. It has a relatively high level of intactness. Any alterations which impact on the significance of the exterior, apart from works listed in the permit exemptions, are subject to permit applications. The court room is the most significant and intact part of the interior. Original fittings including the judge's bench, witness stand and jury box, should be retained. Any works that impact on the significance of the court room, apart from works listed in the permit exemptions, are subject to permit applications. Further modification of offices and service areas in the building is appropriate providing that the original form is maintained. All works should be in accordance with the conservation objectives of the Conservation Management Plan prepared by Robert Sands Pty Ltd, 1996.